HomeNews‘Fortnite’ Season 7 Challenges – Week 10! Hello Fortniters! 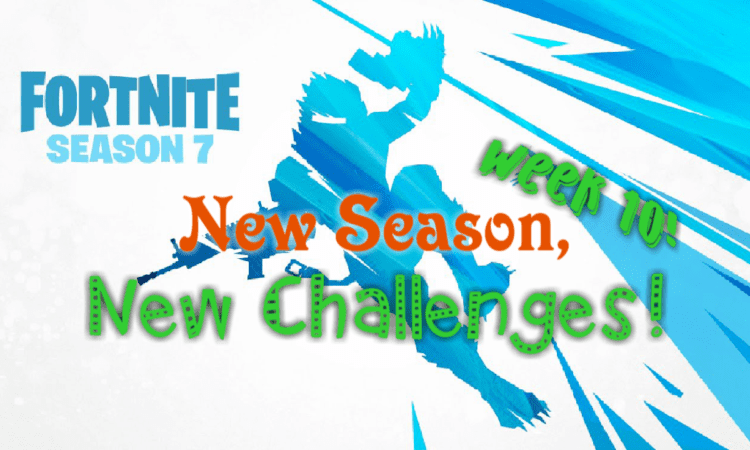 We have made it to our tenth and final week of challenges for season 7! I wish we had some sort of idea what they are planning for season 8, but it is sure to be crazy! Let’s great right down to business and look over what we have to finish to earn those final rewards. This one is super easy. All you have to do is put any sort or turret or trap down and you are done, no kills required! Traps will be easier to find so scavenge for those over turrets. Just make sure you remember the different matches part. Another simple one involving your time and most likely a few matches. Both locations will be roughly the same in terms of loot, so there is not a preferred destination here. Just drop down and start grabbing stuff as quickly as you can and do not forget, you just have to open it! Another week, another killing spree. Can’t we all just get along? Oh well, just find and assault rifle and get to work. If you find a scoped rifle though grab it and use it, you will be helping yourself out with a challenge below as well. Remember up top when I told you that you could help yourself out depending on the assault rifle you chose? This is what I was getting at. The best thing here is you do not even have to get the kill. Just cause 200 damage to your opponent and you are done. Another stage challenge even though it does not say it on the list. You have to accomplish this in different matches. First head east of Wailing Woods to that one, then north of Retail Row to find the second, then finish it off with a trip east of Paradise Palms. Remember to grab at least an assault rifle to help you hit the targets further away. The guys at Epic seem to be getting lazy with the details as the list does not even call out four unless you look right at it. In any case, remember all the red tent looking buildings with zip lines all around? Go there. And go to four of them. And don’t die. Usually once we have made it to the end of the list we are hit with a tough elimination challenge or something, denoted by Hard. This time around we get to finish up with something surprisingly simple. Just throw a Chiller grenade or Boogie Bomb at an opponent in three different matches and you have the list filled out! Have you kept up with all the challenges this season? Are you excited to see how Epic might theme season 8? Given Avengers: Endgame drops in this season (I think) do you think we might see another crossover? Drop to the comments and tell us!